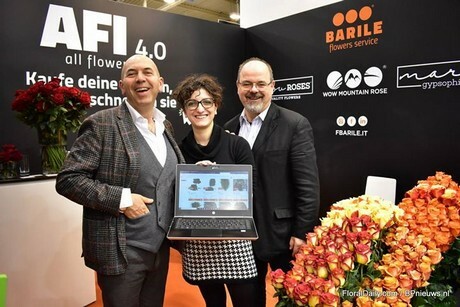 Nino Barile, Barile Flowers Service: "It is something completely new in the industry"
"A web shop that forecasts price is something completely new in the flower industry", says Nino Barile, CEO of Barile Flowers Service. At the IPM Essen, for the first time, they presented their new and innovative web shop, where the buyer can see the prices, quantity and availability up to 8 weeks ahead. "We have a 99% guarantee of what you see is what you get." Nino Barile, Vaslentina Damrosia and Andreas Klan presenting the new web shop at the IPM Essen 2019. Special about the new web shop of Barile is the fact that prices, quantities and availability are being forecast, but how does it work? Barile explains an algorithm calculates these factors by looking at the past as well as the forecasts. "Over the last 20 years, we've built up quite a large database regarding the availability, prices and so on. It uses this information of the past, but also looks at the climatic conditions and weather forecasts at the grower's and buyer's location." On top of that, it also calculates the discounts. "When growers finish harvesting, there might be some stems extra or when a flight is delayed, there will be too much in stock the next day. In this latter case, the system makes a discount in percentage in order to get everything out of storage." Barile finds it important that everyone throughout the chain - from grower to end consumer - benefits from the web shop. "Starting with the grower, the main advantage of using the web shop is that they can set a minimum price and that they can see which orders are next. Then, they can prepare." Then there's the wholesaler, the group that Barile Flower Service is supplying throughout Europe. A strong advantage for them is the fact that they do not have to wait for a quotation. "Usually, when a buyer needs to know the price of a possible future order, they have to wait a couple of days for a quotation. Now, with this new web shop they can directly see what's available in the coming weeks and it has a 99% guarantee of what you see is what you get." On top of that, the wholesalers can give their florists a code to log in to the web shop, which reduces the time that the products are in availability. "By using the web shop in this manner, the stock time can be reduced by around 3 to 4 days. We supply the wholesaler and the florist can directly pick up the flowers." "As a result, the end consumer will enjoy a flower with a longer vase life." After three years of testing, the new web shop was launched on December 3 in 2018 and so far, the reactions have been very positive, according to Barile. "Buyers really like the fact that they can enter any time of the day to see the prices and/or to already buy flowers for events that will take place in the future. In the beginning, many just tried it to test it as they could not believe that all the amounts that were forecasted were accurate. They seemed to be very pleased and for Women's Day, for example, we now see real orders being made through the web shop."